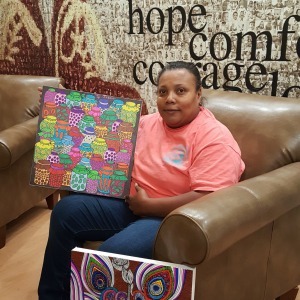 Stress relief through a creative outlet – that’s what Circle Graphics provides parents and families staying at the Ronald McDonald House of Durham & Wake (RMHDW) in their time of need. Since the spring of 2016, Circle Graphics has donated more than 150 coloring canvases to give more than 50 RMHDW families support while their child is hospitalized and receiving critical medical care. Almost half of the families who stay at the House are immunosuppressed, meaning they are on constant isolation from other people or public places for months, or even a year at a time. Viesta King checked in at RMHDW at the end of August 2016 when her 15-year-old daughter, Jessica, was in need of a heart transplant. King waited on a compatible heart while her daughter was in the hospital on life-saving equipment. During her almost six week waiting period, King was given a canvas from Circle Graphics. She shared with the staff that the canvas helped her get through one of the most difficult times of her life. When the anxiety became overwhelming, King said she focused her energy on filling in the shapes on the canvas to remain calm and focused. Jessica now has a new heart and is slowly recovering and growing stronger. King said the canvas she colored will always serve as a reminder of the strength and beauty she sees in her daughter. Circle Graphics’ canvases offer designs and patterns for a range of skill levels from beginner to expert and include feathers, submarines, peacocks, geometric shapes, quotes and more. These coloring canvases are available online with prices starting at $18. To learn more about Circle Graphics, visit www.circlegraphicsonline.com. About Circle Graphics: Circle Graphics is the world’s foremost producer of large-format digital graphics. Circle Graphics’ 400,000-square-foot manufacturing facilities house over 88 grand format printers, custom automated finishing equipment and coating capabilities to produce printed products for the Out-of-Home, Consumer Wall Décor, and Business Products industries. Processing more than 30,000 image files per day, Circle Graphics operates around the clock, seven days a week to deliver extraordinary customer service and prints over 350 million square feet of material each year. Headquartered in Longmont, Colorado, designers create the brightest, strongest and lightest printed products ever made, engineers invent new machines to assemble those products, and chemists whip up the most colorful, environmentally conscious inks in the industry. Because of these people, Circle Graphics can deliver amazing printed products from its five locations and offer exceptional value to its customers.